The Best Port Dickson Beach: Everything You Need To Know! The main reason people come to Port Dickson is the beach! As one of the closest coastal areas to Kuala Lumpur, it’s especially popular among people wanting some beach time and Port Dickson delivers. Located only about an hour and a half from Kuala Lumpur or even closer from Kuala Lumpur airport, Seremban or Melaka, it makes for a very convenient stopover or weekend trip. You can read full details about how to get to Port Dickson from KL here or from Singapore here. There are many choices for the best beach in Port Dickson. The 18 kilometre long coastline is full of them! Some of the resorts have access to a private beach Port Dickson, but there are also many public Port Dickson beaches so you are spoilt for choice. Beaches are generally clean. In fact, I have seen someone actively cleaning most beaches I have visited in Port Dickson. Some have facilities like toilets and changing rooms as well as being adjacent to public parks, food stalls and hotels. The most popular Port Dickson public beach is Blue Lagoon Port Dickson or Teluk Kemang. These are both south of Port Dickson town. At the end of this article, I’ll let you know my absolute top picks! 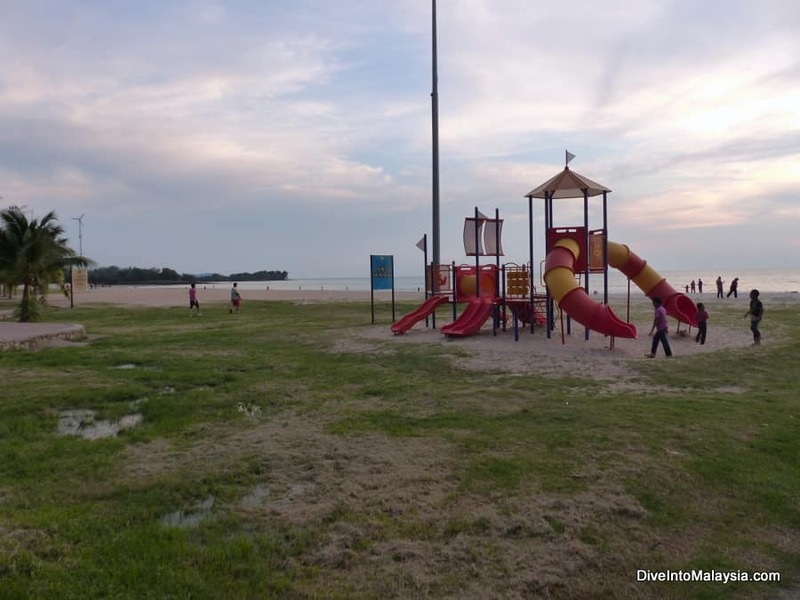 Below is our Port Dickson beach review. They are listed in south to north order. There is a map to help you work out what is close to your Port Dickson hotel. Our Choices For The Best Port Dickson Beach! So What Is The Best Port Dickson Beach? Pantai Cermin is perfect if you are looking for a quieter beach near Blue Lagoon. 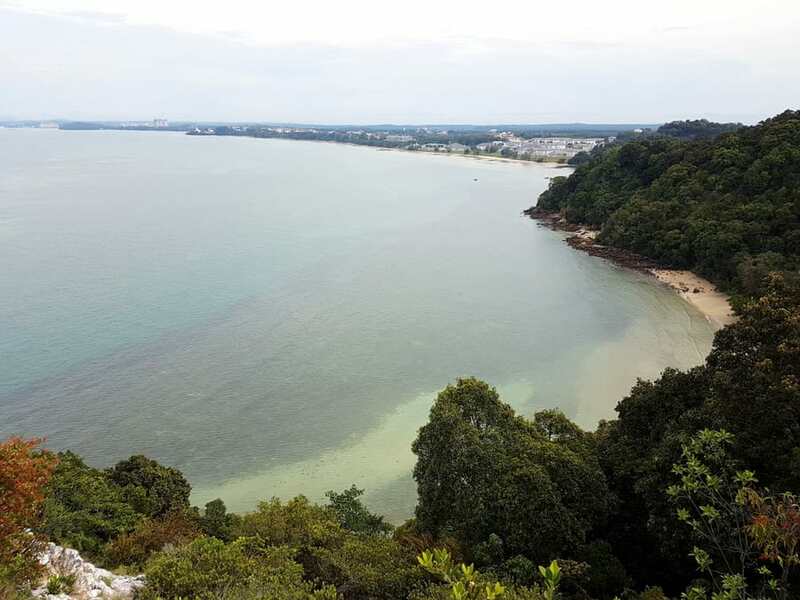 It’s located directly behind and close to the jungle at Tanjung Tuan. Black ore deposits also wash up. It’s a larger beach and the water is clean but it does look murky thanks to a muddy sea bed. It’s one of the cleanest beaches we have visited though. This beach is meant to be the perfect place to watch a sunrise and it’s a great beach to go to if you want somewhere nice that doesn’t have crowds. It’s easy to visit here at the same time as a visit to Blue Lagoon. The downside is that it doesn’t have the shade of Blue Lagoon and it feels a lot hotter here. At the eastern end, you end up at the Lexis Hibiscus resort where you can eat at their hawker centre or play at the JPark water park. The Lexis Hibiscus is recommended for easy access to this beach and also the best stay in Port Dickson! Click here for the latest prices or read our full review here. Tanjung Tuan is the place to go when you want to get away from the crowds and enjoy nature and don’t want to get in the water. This beautiful spot is also known as Cape Rachado and is famous for its historic lighthouse. It is a wildlife reserve centre so there is far less development than elsewhere. In fact, you will need to walk here as its surrounded by dense jungle. It’s about a one kilometre hike. Between the jungle, the white sand and the clear water, this is a truly beautiful spot that you may be lucky enough to have to yourself. The downside is that swimming is not recommended due to the risk of hurting yourself on sharp rocks. For easy access to Tanjung Tuan, stay at PNB Ilham Resort by the wildlife reserve entrance and Blue Lagoon Beach. There are many apartments available as well as a large pool to cool down in after your hike. Blue Lagoon on a Monday morning! Blue Lagoon, also called Tanjung Biru, is a very nice beach in Port Dickson which is popular, but more secluded than other choices thanks to being about 17 kilometres south of Port Dickson town close to the Tanjung Tuan Forest Reserve. This means that there is often wildlife to spot such as squirrels and monkeys. It’s a pretty spot with vegetation and forests surrounding it and, despite being busy, this is a relaxing spot where it is nice to just be. There are beautiful big trees on the beach so it is naturally shaded as well. The upside of the popularity means there are good facilities here with toilets, a hawker centre, market stalls and a playground. It’s easy to spend an entire day here although it did have more trash than many other beaches on this list. The Blue Lagoon Beach Port Dickson is especially good for families or non-swimmers thanks to calm and shallow waters. Sandbanks protect Blue Lagoon from currents and strong tides. This also means water sports are kept away from the shore and you don’t need to worry about motor boats and jet skis taking over the sea. At low tide, many rock pools are revealed which kids will love. For an even better experience at Blue Lagoon, stay by the beach! PNB Ilham Resort is a great option with hotel style rooms and apartments right by the beach. For a better quality resort, the Lexis Hibiscus is close by too. Small Pantai Purnama with the Klana Beach Resort in the background. Pantai Purnama (Moonlight Beach) is a small beach option just before Teluk Kemang as you head north. We visited here when the tide was in so there may be more beach when you visit! It’s more out of the way than some of the others listed here even though it is just off the main road. It’s meant to be popular in the evenings but we found it a pretty spot during the day with no trash and bathrooms and a restaurant right there. There were some big clumps of seaweed in the water though. There are also many small gazebos where you can rest and enjoy the sea or have a picnic. To be close to this beach, consider staying at the Klana Beach Resort which is pictured in the photo above. You can easily access both this beach and Teluk Kemang from here and there is even an observatory on site! Teluk Kemang is between the 7th and 8th mile from Port Dickson town and is the largest and most popular Port Dickson beach which is both good and bad. This is the place to go if you want atmosphere, shops and water sports. There’s also a lot of great food. There are a lot of hotels and apartments here and it can be a convenient place to stay for beach access. There are many facilities including multiple car parks, paths, toilets, showers, change rooms, prayer rooms, shops, food stalls and restaurants. There is also a large square with activities. Just some of the food stalls – there are many! There are many water sports and this can mean its harder to swim in the sea and the area can be loud. You can also rent a gazebo. It gets crowded on weekends and holiday periods. In fact, I don’t recommend this beach for swimmers which is a shame as it is a pretty and clean beach. This beach is strictly for people who want water sports and/or action and atmosphere. The sand can be an orange colour and the sea can become rough. There are often kids activities set up like pony riding and bouncy castles at busy times. My wife visited on a weekday when the beach was relatively dead. However, there was still a lot on the beach. She found the attention from the males selling water activities uncomfortable and would not visit alone at a non-busy time again. For easy access to Teluk Kemang, stay at Ancasa Residences where there are roomy apartments and a large pool. Pantai Cahaya Negeri or Cahaya Negeri Beach is maybe Port Dickson’s best beach. It has a great expanse of beautiful white sand and the water is clean. This does mean the beach gets crowded at holiday periods. 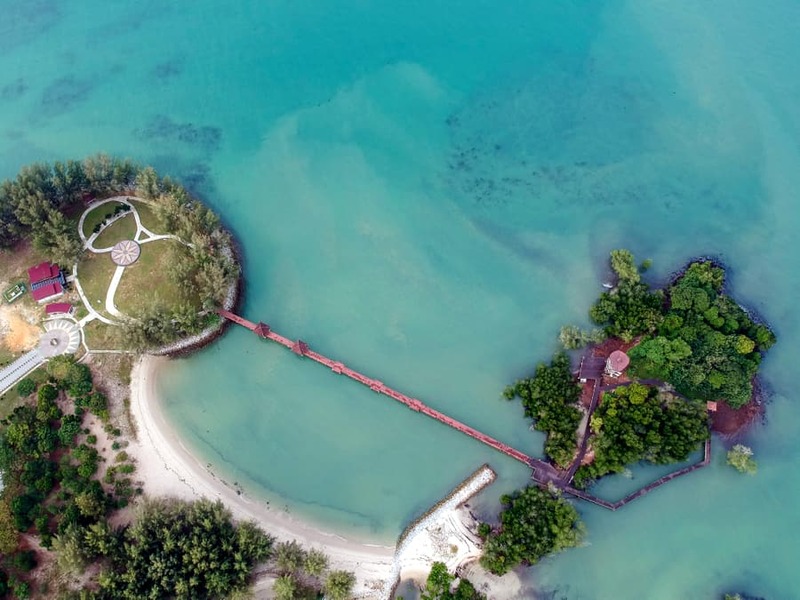 There is a recreational park and a cool bridge (called “Lovers Bridge”) over the water which takes you to a mangrove island (pictured above). This is a great place to take some awesome holiday snaps and just enjoy walking around. There are toilets and many picnic tables in a nice park area next to the bridge. There is a lack of other facilities. You can eat in a food court opposite Bayu Beach Resort or keep walking up to nearby Pantai Saujana. 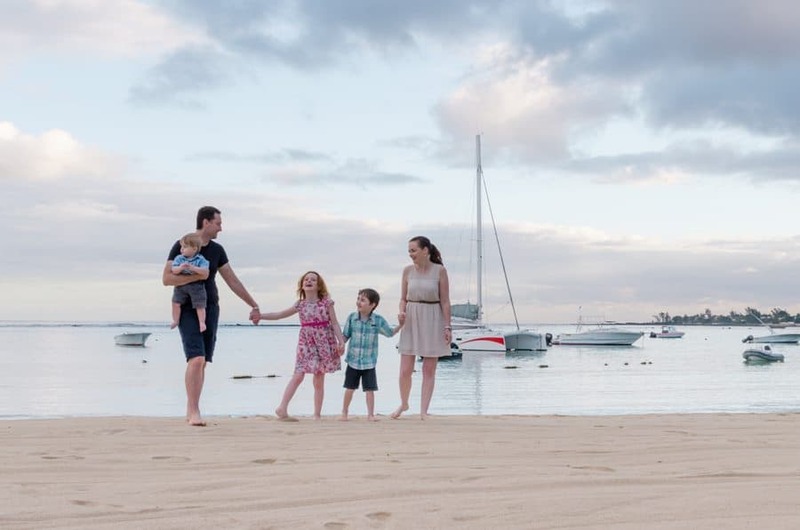 It is one of our favourites and we recommend a visit, even to just walk across the beach, see mangroves and take some photos. Stay at Bayu Beach Resort right by the beach. There is a great pool and it’s convenient to eating options. Saujana Beach is about a kilometre long and is centrally located a few miles from Port Dickson town starting at the Avillion Port Dickson. It’s right next to the lovely Avillion Resort and there is a playground, changing rooms, toilets and food and drink vendors. The main entrance is opposite the Saturday Night Market and it’s easy to access this beach. It’s especially popular in the late afternoons. There are restaurants and plenty of parking. It’s a calm, clean beach in Port Dickson and the sand is soft and powdery. Despite the central location, it’s usually quite peaceful and there is plenty of space. Water skis and banana boats are available, but they don’t take over the beach. Avillion Port Dickson is one of our personal favourites in Port DIckson with gorgeous, well priced, over water chalets and is located on one end of this beach. Pantai Bagan Pinang is another powdery white sand beach to visit in Port Dickson. There is more trash than I am used to seeing on beaches on this list but then I wonder if I went at a bad time as I have heard many others say it’s trash free. There is a small part of this beach next to the Avillion then some rocks and then a bigger stretch. If you start at the smaller part, where there is a playground, I recommend walking to the bigger stretch which is nicer and wider. There are lots of eating options nearby as well as picnic tables, toilets and showers. You can also rent beach and water equipment on weekends and there are some activities like banana boats. This beach can be a good balance between activity and taking it easy. Avillion Port Dickson is also located on one end of this beach. We highly recommend it! 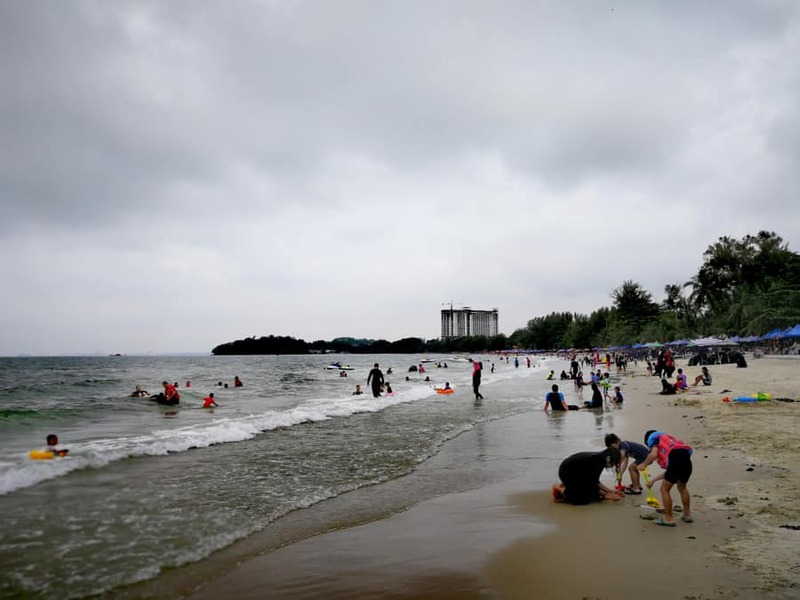 Also known as Glory Beach after the Glory Beach Resort that sits on its shores, Pantai Tanjung Gemok is perhaps the best option north of Port Dickson town. It’s a quieter option of the beaches listed here and the water is generally calm although it can get busy at holiday time. There is a nice paved pathway along the beach complete with a playground. This beach is nice enough for a swim if you are staying in the area but there’s nothing really special about it either. There is a small turtle hatchery managed by Glory Beach Resort which is worth a visit if you can. Unfortunately, I don’t have a good photo of this beach but you can get an idea of what it is like from the photo above from the Glory Beach Resort. Stay at Glory Beach Resort right on the beach. It has some great facilities including the turtle hatchery. There is also the Lexis hotel at the northern end of the beach. Honestly, I have a few favourites – it depends what you are after! If you want the prettiest beach, my choice for this is Blue Lagoon (full info here!). If you want a more interesting stop, I recommend Pantai Cahaya Negeri. We like being able to walk over the bridge and among the mangroves and it makes a beach visit more interesting. If you want a fun beach in the early evenings, I recommend Pantai Saujana especially on Saturday nights for the night market. If you want water sport action, try Teluk Kemang. Otherwise, just go to the beach most convenient. You’ll most probably have a great time! 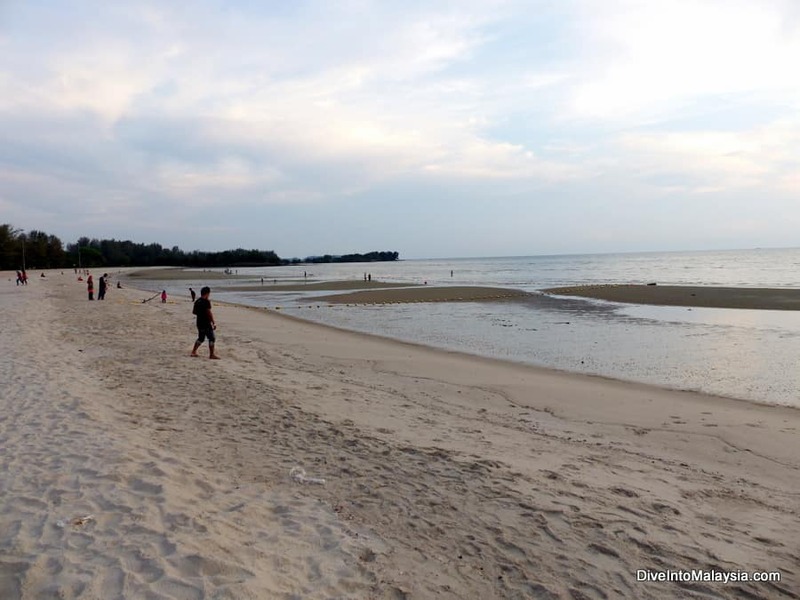 What’s your pick for the best Port Dickson beach? Read about the best beaches in Malaysia here, our full Port Dickson guide here or about more things to do in Port Dickson here. Looking For A Port Dickson Water Park?